BitDeer.com which is a leading computing power-sharing platform has announced the presale of S17 mining plans which is also a means of distributing the Antminer S17 series miners which were launched recently, says recent report. 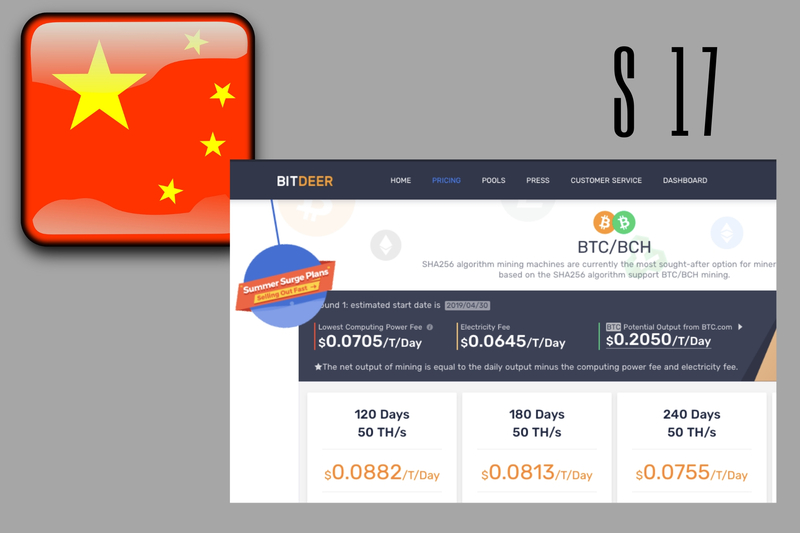 The S17 plans by BitDeer support the mining of both Bitcoin Core and Bitcoin Cash and the services will be rendered in durations of 120-day, 180-day, 240-day, and 360-day. BitDeer’s S17 plans presale are now available on the platform’s website. The Antminer S17 series miner was launched by Bitmain, a China-based mining giant on the 29th of March and it is powered by the latest and updated 2nd generation 7nm ASIC BM1397 mining chips. It will help to reduce the expenses spent on mining because it has an energy efficiency ratio (EER) of 39.5 J/T as well as a nearly 60% reduction in the cost of electricity. The first set of Bitmain’s new miner that was put up for sale reportedly sold out in 5 minutes. “For our new energy-efficient new plans, electricity price will only make up 39 percent of the mining costs.” She added. During the 2019 New Age Mining Summit, Lu officially announced that the new S17 plans can now be accessed. The New Age Mining Summit is a guided event of the crypto mining industry in China and for 2019 edition, Chinese mining leaders and professionals gathered in Chengdu, Sichuan Province of China because of the industrial confidence infused by the abundance of low-cost hydroelectric power within the region. The entire industry is preparing to experience a bullish season due to the preparations to exploit the low-cost of hydroelectric power during the summer after the increased rate of rainfall in the South-Western part of China.